Who makes the best replacement gauge set hoses for refrigeration? Thread: Who makes the best replacement gauge set hoses for refrigeration? Newbie here and though I have used my hoses several times since I got my certification I keep losing the rubber seals out of my hose fittings. I'd like to find the best I can get to prevent the loss from happening again. Thanks Spitz, I had seen the hoses with ball valves and thought it would be handy to reduce the De Minimus releases to an absolute minimum. Good idea, Thanks again! I’d recommend JB as well. The hoses and low loss fittings seem to last much longer than Yellow Jacket. I HATE low loss fitting. Too many instances of them not releasing properly and leaking refrigerant under pressure from the access port. Plus I think they are too bulky. I only use hoses with ball valves. What hoses have you been using that have lost the seals? I cannot recall any hoses I’ve owned which have done that. I keep a bunch of the o-rings for low loss fittings. They like to disappear from the high side when disconnecting from a 410 system. Are you blowing out the seals or are they getting damaged? The issue may not be the hoses, but the way you are replacing the gaskets. Sorry I haven't replied sooner but really sick right now. Kinda wrecks Thanksgiving when you can hardly breathe. The company bought this set of gauges and hoses for me and they are no name hoses. The High side hose seals popped out after my last test and the schrader valve fell apart. I'm going to order some new ones right away. My center hose is a yellow Jacket and it's holding up just fine. I haven't had any problem with the low loss fittings releasing with just a short puff of gas. At least until I discovered my High Side Schrader valve had fallen apart. I tossed the hose as soon as I found the problem. I will check out the JB hoses. Hope my boss will pop for the better equipment. Are you speaking of the Schrader valve depressors in the hoses? 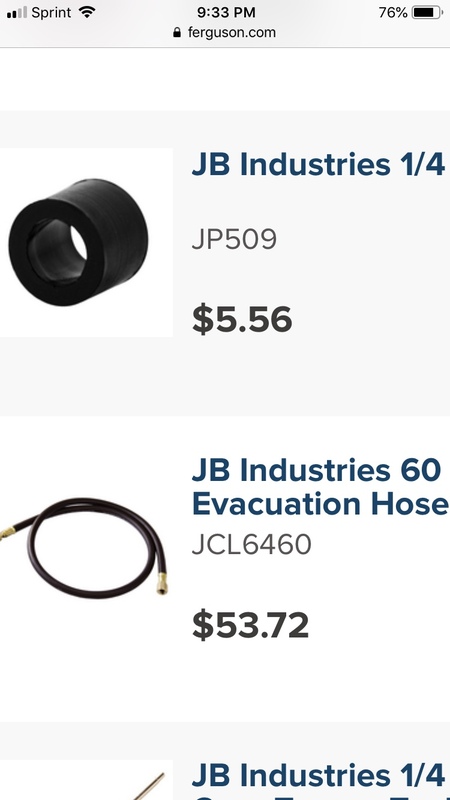 If so the jb hoses usually have the rebuild kits for them in the same area. Are you talking about seal-right low loss type hose ends? Or just the o-rings for standard non-low loss hoses? Either way, they are repairable. If the seal-right style, then they seem to fail when switched back and forth from POE to Mineral - the rubber swells. The seals in my hoses look like a small tube section about 1/4" long with 1/8" ID. My boss OK'ed a new set of Yellow Jackets with ball valves so I'm not going to worry too much about the old hoses for now. I do like maintaining my equipment as you are less likely to get any nasty surprises when you are in the field. Thanks all for the replies I'm glad I found this site as I am sure I'll need help from time to time. I work on maybe 4 or 5 appliances a year in the course of doing my job but I need to keep up on future upgrades and tips. These are the best hoses I have used so far.